A TASTE OF YELLOW is your chance to participate in LIVESTRONG Day by doing what food bloggers do best - bake. LIVESTRONG Day is the Lance Armstrong Foundation's (LAF) grassroots advocacy initiative to unify people affected by cancer and to raise awareness about cancer survivorship issues on a national level and in local communities across the country. LIVESTRONG Day 2007 will occur on Wednesday, May 16. You are wondering why someone in New Zealand would be supporting an event based in the US aren't you. Well for the simple reason cancer knows no boundaries. There isn't a person in the world who hasn't been touched by cancer in some way. Either a family member, a friend, work colleague, neighbour or even themselves. One of my best friends and my Dad both died of cancer in the same week. Twelve months later I was diagnosed with cancer and am still fighting the disease, hoping to be cancer free one day. To raise awareness in any country is to raise the level of awareness world wide. I'm asking all bloggers to participate in the blog event A TASTE OF YELLOW by making a dish containing some type of yellow food. This can be anything you like as long it features a yellow food. Some ideas to get you started are lemon, banana, saffron, corn, eggs, cheese. On the 16th May to coincide with LIVESTRONG Day 2007 I will post a round up of all the entries. Please make and post your entries using any yellow coloured food and send them to me at atasteofyellowATgmailDOTcom before the 7th May. The A Taste of Yellow has been approved by the Lance Armstrong Foundation as an official LIVESTRONG Day event . I am organising the event to raise awareness of cancer. However if you wish to make a donation you can do so by visiting the Lance Armstrong Foundation donation page. Please support LIVESTRONG Day in your city. You will find a list of all events here . 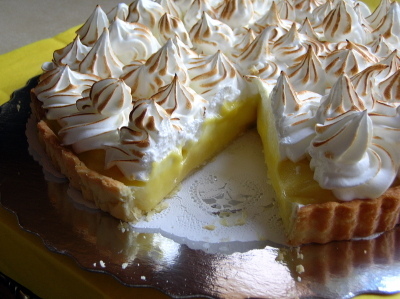 The beautiful Lemon Meringue Pie above is a creation of Ivonne at Cream Puffs In Venice . Thanks Ivonne for allowing me to post your photo of delicious yellow food. UPDATE: THE ROUND UP OF ALL THE ENTRIES TO A TASTE OF YELLOW HAS BEEN POSTED HERE. GO VISIT AND SEE THE 148 ENTRIES OF YELLOW INSPIRED FOOD.